Do you want to understand English better? Do you need English for school or work or to reach a special goal? EnglishHints can help you learn more English and understand it better, read and write it more fluently, and prepare for English-language tests and projects. It also provides activities, lesson plans, and materials to make teaching ESL easier and more rewarding. The best way to learn vocabulary is to read and practice it over and over in context. The easiest way to improve reading skills is to read a lot on the same subject, so that you recognize the ideas and vocabulary and can integrate them into your own thinking. For these reasons, among others, EnglishHints tries to connect and cross-link reading, activities, and vocabulary practice as much as possible. The English Detective newsletter is especially useful for making those connections. Each issue (usually twice a month on Tuesdays) has a theme with related readings and resources, and often also vocabulary and exercises. You can subscribe below, or see Building Vocabulary Month by Month for more information. Listen, read, and practice whenever you can! √ Even a few minutes a day will make a real difference. Play a game, learn an English idiom, or do an exercise from this site when you have a few minutes free. 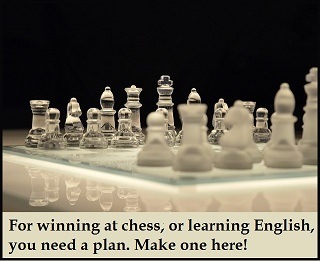 √ Make yourself think in English! Tape notes to the bathroom mirror, sing a song in English while you clean or do chores, listen to the radio or a podcast in English while you exercise. √ Read a lot! Study English language newspapers online, analyze journal articles in your field, read stories to your children, even read ads—-anything that makes you think in English! Try this short quiz to see if the lessons and exercises in EnglishHints.com could help you learn English online.
. For question 3 see Negative Prefix List. For 4-6 see Common Idioms, which has the links to the alphabetical index pages. When I thought about how to explain the difference, I realized I would need to teach some grammar terms. (I was trying to prepare students for advanced-level tests of thinking and judgment like the NCLEX or TOEFL.) Grammar explanations can help you understand the reasons behind confusing sentence structures. In question 8, all of the sentences are similar in meaning. However, A, C, and D talk about considering only profitability (A), costs (C) or value (D). The example sentence talks about “all the different ways it may impact their business.” Sentence B is similarly inclusive. It talks about its “various possible effects on their profits and other products”—not just its costs or profit. For specific suggestions for your level, or for specific purposes like preparation for a test or business English, see Study English Online. Just minutes a day in English will help you reach your goals. Enjoy the journey! Suggestions for using EnglishHints to study English according to your level, needs, and interests. Get ready for big exams like the TOEFL and IELTS with English Language Test Prep: learn about the tests and practice the skills you need for a good score. 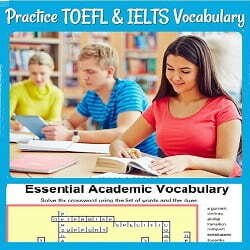 Practice important academic vocabulary for the TOEFL or IELTS exam (as well as for university study & professional work) with these games & practice activities, from gap fill exercises to multiple choice, categorizing, & matching. ESL Lesson Plans includes my best advice for new ESL teachers, as well as links to useful resources, planning ideas, and some of my classes' favorite, highly engaging lesson plans. Practice your listening & reading comprehension with these exercises based on various reading sources and talks. Many include the same kinds of questions you will find on exams like the TOEFL & IELTS. Review what you need to understand about English sentence structure and parts of speech with the links to these grammar lessons.